FIFA's new global strategy to grow the women's game is prompting both praise and skepticism. Soccer's governing body has been addressing the women's side of the sport in the past several years, partly in response to calls for more equity. The result is a five-pronged proposal announced this week that focuses on the grassroots level among FIFA's 211 member associations. FIFA wants to see women's participation double to 60 million worldwide by 2026. A key component will be insuring all associations have comprehensive women's plans in place by 2022. The strategy will leverage the Women's World Cup in France next summer to drive growth. "Whenever we're talking about these big sweeping changes, for FIFA it's a huge deal, but I also want to see it actually happen. I want to see not only the growth of the game, but I also want to see money get into the hands of the women who are actually growing it," Wambach said. 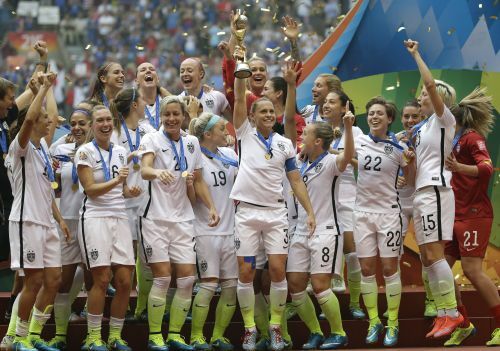 Last month, FIFA pledged to increase prize money for the women's event. The U.S. women's team earned $2 million of a $15 million pool of prize money for the 2015 World Cup; the French men's team earned $38 million of a $400 million pool for winning the World Cup this summer. FIFA has been criticized for not committing to using video replay to assist referees at next year's World Cup. Video assistant referees were used in the men's World Cup for the first time in Russia. The organization says a decision about VAR will come "in due time." Some have complained the women's final on July 7 is the same day as the Copa America final in Rio de Janeiro and the CONCACAF Gold Cup final in Chicago, which could take attention away from the women's game. U.S. coach Jill Ellis, speaking after a World Cup qualifying match on Wednesday night, was pleased with the effort to grow the sport. She also criticized the scheduling conflict on the day of the women's final. "They're targeting participation numbers, and they're targeting marketing. All of these things are excellent for our game in terms of willingness to grow our sport, grow our brand and make it more available and supportive. I think it's great. We need to make sure that it is supported. In my own personal opinion, playing three big matches in one day isn't supporting the women's game. So, there you go," Ellis said. "FIFA says it's taking action to promote grassroots football while enhancing the commercial value of the women's game. What they refuse to see is that the value in the women's game is already there, yet they continue to perpetuate the inequalities," Solo told The Associated Press. "Until their actions are in line with their words, then it is just more lip service. Maybe we are just supposed to be 'grateful' for any amount of progress, but any new strategy needs to address equality across the board." The framework launched Tuesday was approved by the FIFA Council last year. It's linked with the FIFA 2.0 vision statement and the creation of a new women's soccer division unveiled by President Gianni Infantino in 2016 after he replaced Sepp Blatter as FIFA president. While Infantino has often advocated for the women's game, there have been questions about how FIFA funding trickles down to women's national team programs. In an August exhibition between Puerto Rico and Argentina, Puerto Rican players stopped after kickoff, gathered together and pointed to their ears, protesting what they say is a lack of funding. Puerto Rico's players were inspired by the efforts of other women's teams — including the U.S. and Australia — to secure more equitable salaries, funding and treatment. "At this point for us, those federations and those players are at a different level than we are. We're right now just asking for the basics," midfielder Nicole Rodriguez said. "Like fields to practice on that aren't water logged, and that we're not the second-choice clubs to have priority. We want friendly games so we can continue to improve our FIFA ranking and be adequately prepared. And camps, like four camps a year. We don't have any of that." FIFA aims to demonstrate to member associations that women's soccer represents an area for growth, said FIFA Chief Women's Football Officer Sarai Bareman. The organization will hold workshops to help member associations implement the strategy. "I think we're trying to change the perception, that women's football is not this kind of poor little sister waiting for the handout from the big brother of men's football. We want to bring it into the mainstream," Bareman told The AP. "Because everybody in FIFA and across football's governing bodies should be looking at football as just football."